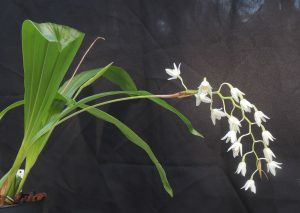 Coelogyne flexuosa is a fairly large growing Coelogyne native to warm forests in Malaysia, Sumatra, Bali and Java from 900 to 1500m altitude. It grows lovely large bright green leaves and in spring produces long delicate flower spikes with up to twenty fragrant, small but pretty flowers. The spike has a very noticeable zig zag which gives the species its name. 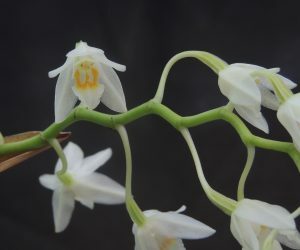 Despite not being the most showy Coelogyne we are delighted to grow the species and find it is reliable and well worth its space in Warm Asia where it grows through the summer and flowers from the top of the mature pseudobulb. We suspect it will eventually make a fine specimen plant.